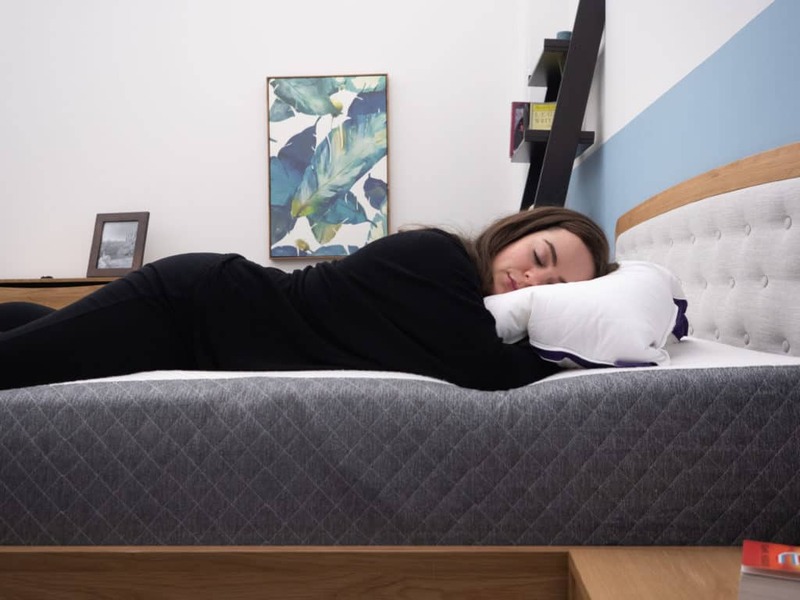 As the wide world of bedding continues to grow, it can be tough to find the sleep accessories that are best for you — especially since everyone’s slumber habits are different! 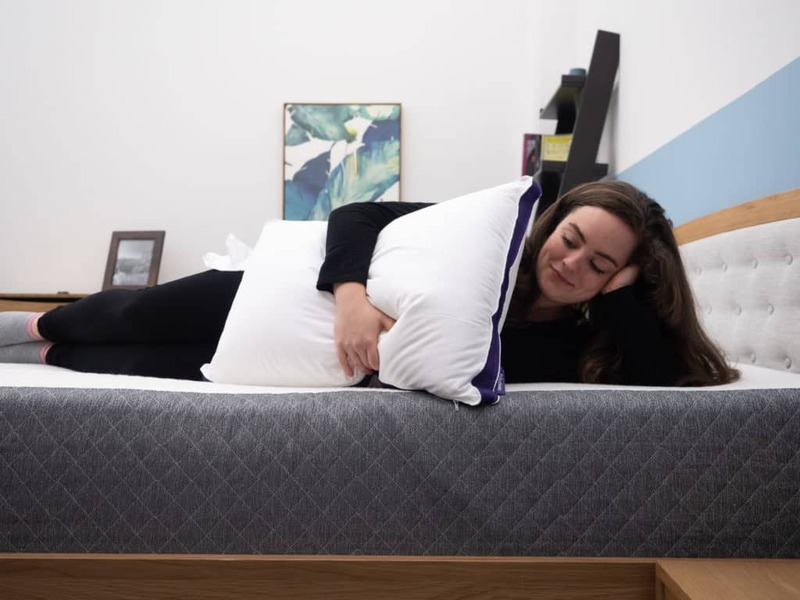 That’s why the folks at Polysleep (who also make an all foam mattress) suggest that the way you catch your Zzz’s says a lot about your personality, and tapping into the details of your personal preferences is a great way to find the perfect pillow. That’s also why they designed an adjustable pillow that sleepers can customize to suit their unique needs. So, Sarah from Sleepopolis is here to investigate! I’m going to show you what this pillow is made of, how to adjust it, and thoroughly test its full performance so that you can better decide if this pillow is the one for you. No time to read the full review? No problem! Click here to skip to the review summary. 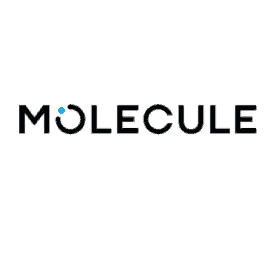 Get your set of Molecule sheets today! WHAT’S THE POLYSLEEP PILLOW MADE OF? The cover fabric of this pillow is made from 100% cotton and feels super soft and breathable. A purple band of mesh paneling surrounds the perimeter of the pillow, enhancing the breathability of the pillow as well as adding a little aesthetic flare. Each side of the pillow’s cover is filled with a fluffy, down-like material called polyester microfiber which offers a feathery cushion for sleepers to rest their heads. In this way, the outer cover serves as an extra pillow that would still be softly supportive even without the internal fill. 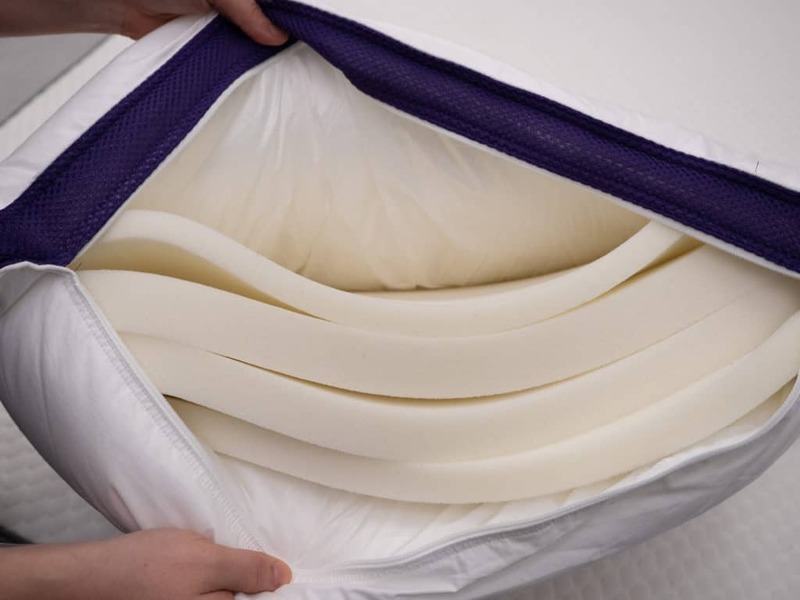 A zipper discreetly spans one side of the pillow, allowing easy access to the four layers of viscoelastic foam inside. Why would you want to access the inside of the pillow? Well, to adjust it, of course! Each layer of foam inside this pillow is removable, and has a different loft, so that sleepers can manipulate the firmness and feel. 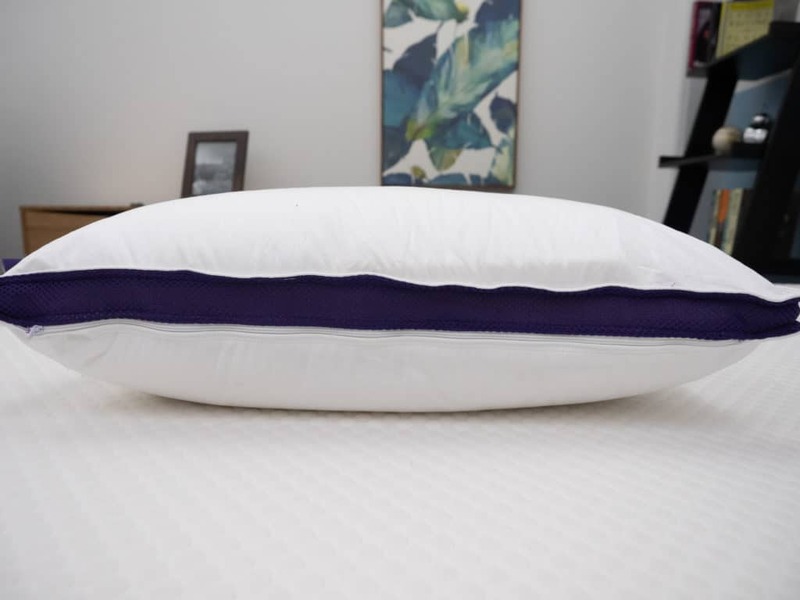 Each individual layer of foam offers soft support with a quick response to pressure, but as you add more layers, the pillow increases in loft and firmness. With all four layers of foam inside, this pillow has a lofty build of almost 9 inches, and a medium-firm feel. With every layer you remove, the loft decreases and the support becomes softer. Because of the adjustable nature of this pillow, the folks at Polysleep say it’s all all-position pillow suitable for sleepers of all styles. But I won’t know for sure until I’ve tested it myself! HOW DOES THE POLYSLEEP PILLOW FEEL? The feel and support of this pillow depends on how you arrange the inner layers of foam. Depending on how you configure the layers, the Polysleep pillow’s firmness can range from soft to medium-firm. However, even with every layer of foam inside, this pillow never reaches a firm level of support, as the the fluffy microfiber serves as a buffer to keep things feeling soft and cushy. The cotton cover and mesh paneling enhance the pillow’s airflow, helping the sleeper to stay cool. Foam does have a reputation for trapping heat and warming up, so the foam in this pillow is ventilated which means it was designed with breathability in mind. When you press into the pillow, you can feel the air escaping through the mesh paneling which is a good sign that it’s working to dissipate your body’s heat. 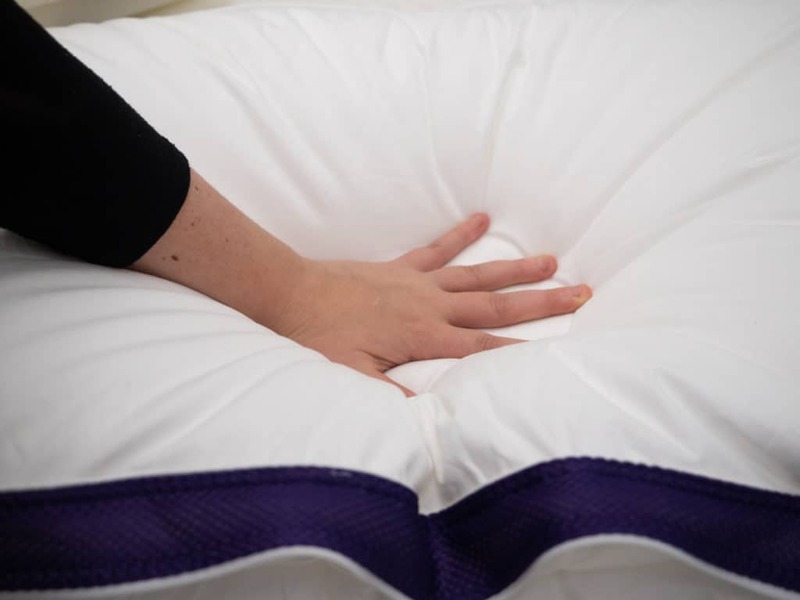 As you add more layers of foam to the pillow, the response to pressure becomes slower. However, even with all four layers inside, the response to pressure is still at a happy medium between quick and memory-foam-slow. The foam fill is designed to conform to your head and neck, allowing a nice sink into the material while keeping your spine in healthy neutral alignment. Because each layer of foam is a different height, sleepers can adjust both the loft and the firmness level. 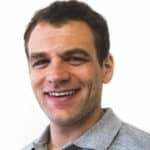 For example, leave the two loftiest piece of foam inside for a soft-medium feel, leave only the shortest piece of foam inside for a soft, thinner feel, or remove them all for a super soft and foldable pillow. Sleepers should feel free to play around with the various configurations until they’ve customized their perfect pillow. By removing every layer of foam, the pillow becomes much more malleable and thin, which might be ideal for stomach sleepers. Conversely, leaving all four layers in offers lofty, medium-firm support that might lend itself best to side sleepers. However, a lot comes down to personal preference and sleep style and the only way to really know which layer configurations are best suited to which position is to test them all! HOW DID YOU LIKE IT, SARAH? I’ve tested dozens of adjustable pillows, but typically the internal fill is shredded rather than stacked in individual layers of foam. So, I wasn’t sure what to expect when I first took a look inside the Polysleep pillow. With four removable layers and myriad ways to configure them, I felt overwhelmed with possibilities! So, I began testing this pillow on my back, exactly as it came (with all four layers inside). Right away, I could feel that the pillow was too firm and lofty for this position. As I said before, this pillow is about 9 inches tall with all layers inside which is a pretty lofty build, and the medium-firmness was not allowing for enough of a sink into the pillow. So, I reached in and pulled two layers out. Ah, much better. With only two of the smaller foam layers inside, I felt like the fluffy microfiber that fills the cover combined nicely with the medium support of the foam. Lying on my back, I felt like my head and neck were being comfortably cradled, and my posture felt healthy and relaxed. I tried a few other foam configurations as well, but found them to be either a little too lofty or a little too soft. It didn’t take long for me to realize that this pillow calls for a bit of a Goldilocks method of trial and error. It takes some adjusting (and patience) before you find the combination that is best suited to each position. So, after testing every configuration of foam layers, I found the ones that work best for me. As I said, I felt that leaving the two layers of foam with the lowest loft inside the pillow worked best for back sleeping. The foam was acting as my support system and conforming to my head and neck, while the microfiber was bumping up that fluff factor which enhanced the overall comfort. Of course, every sleeper is different, so be sure to test this pillow until you find the feel and support that’s right for you. For stomach sleeping, I like a squishy, shapeable pillow with a very low loft — so I took all the foam out. With only the microfiber working to support me, I was able to fold, press, and punch this pillow into the shape that worked best for me. Most importantly, I was able to compress the pillow enough to ensure neutral spine alignment, while still enjoying a soft, cushy place to rest my head. Of course, we’ve learned that stomach sleepers should generally prioritize a low-lofted pillow anyway, but I do think that they could also enjoy this pillow with one of the shorter layers of foam inside as well. I didn’t find it to increase the loft so much that it craned my neck upwards and out of alignment with my spine; I just preferred the feel of the pillow without any foam inside when sleeping in the prone position. For side sleeping, on the other hand, keeping all four layers in worked very well for me. The high loft, medium-firm support, and fluffy outer cover all combined to offer me healthy posture, pressure relief for my shoulder, and a feathery-soft place to rest my face. Again, I think sleepers could play around with the layers until they find the configuration that works best for lateral sleeping, but you’re still going to want this pillow to maintain a higher loft with medium to medium-firm support to ensure healthy spine alignment. So, if you find all four layers to be a little too much, try removing a layer! Amidst all my rolling around with this pillow, I was pleased to note that it did a pretty good job of keeping me from warming up. I wouldn’t say it kept me cool, but it felt breathable enough to dissipate my body’s heat and keep me from getting warmer than I already am. The only thing that annoyed me a little bit was that, well, this pillow is kind of a lot of work! There’s a lot of adjusting and re-adjusting to go through before you find your perfect comfort zone, and sometimes you just want your pillow to be perfect as is. That being said, I think if you’re patient enough, this pillow has something to offer sleepers of every style. Because of the adjustable nature of this pillow, and the fluffy microfiber that fills the outer cover, I found it to work great for both of these sleep styles. Personally, I left all four layers in for each style as I like my pillow to be big, lofty, and huggable when I’m using it for under-the-arm or between-the-leg support. Using it as an under-the-arm hugger felt comforting and supportive as it’s lofty enough to sort of wrangle in and pull close to my chest. It also offered me some nice pressure relief in my lower back when I held it between my legs. In fact, I think layering of foam is kind of perfect for between-the-leg support as it helps the pillow to conform to your shape rather than flattening under the weight of your leg. SHOULD I BUY THE POLYSLEEP PILLOW? Is a Combo Sleeper — Because you are able to customize this pillow to meet the loft and firmness of your liking, combo sleepers might benefit the most. By adjusting the layer configurations, most folks should be able to find comfort in every sleep style and position. Likes a Lofty Build — With all four layers inside, this pillow has a pretty lofty profile of about 9 inches! Of course, you’re welcome to remove layers as you see fit, but sleepers looking for a lofty pillow would be particularly compatible with this one — especially with all the layers inside! 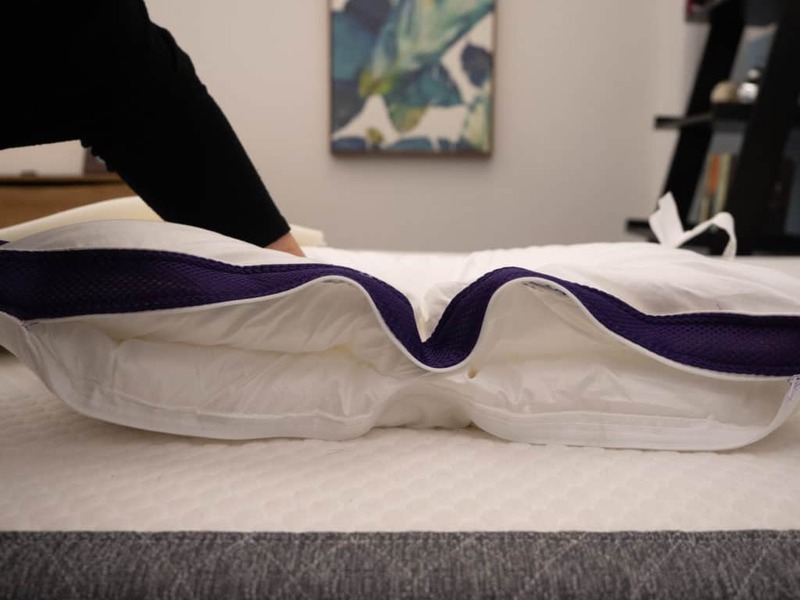 Is a Fan of Foam — The viscoelastic foam inside this pillow offers sleepers a nice sink into the material, and the response to pressure varies according to how much foam you leave inside. If you love the feel of foam, or want a foam pillow to complement your foam mattress, you might want to give this one a try! Patience is a Virtue — The adjustable nature of this pillow lends itself well to sleepers of all styles, but the process of removing and adding the individual layers of foam can be kind of a hassle. It’s not like with a shredded adjustable fill wherein sleepers can unzip, grab a handful of fill and zip it back up again. With the Polysleep pillow, the foam layers can be a little tougher to manipulate. Can’t Wash the Foam — While the outer cover can be washed, the inner foam layers cannot get wet at all. So, it might behoove you to be extra careful around this pillow (no eating in bed!) because there really is no way to wash the foam layers inside. Not Fluffable — The outer cover itself is quite fluffable, but most sleepers are going to want to enjoy at least one of the foam layers inside this pillow. And the more layers you add, the less fluffable it becomes. Sleepers who like a fluffable, foldable, shapeable pillow should give this one a try before fully committing. 30-Night Trial Period — Not sure this pillow is right for you? Polysleep offers you 30 nights to test it out before fully committing it to your bedroom. If you don’t like it, send it back for a full refund. Care Instructions — The outer-cover can be washed, and the folks at Polysleep recommend hand-washing it. Tumble dry on low heat. The inner foam layers cannot be washed. Sizing — The pillow comes in one size which measures 19”x 26”, and up to 9 inches in height, depending on the number of layers you leave inside.